A little over a month ago I posted here about the unfortunate news facing the Olive books: publisher bankruptcy (the Chapter 7 type). Few, if any, follow this blog because it is, admittedly, not used very often as a source of information. However, I’m certainly glad I posted the announcement about the bankruptcy because it did prove immensely beneficial. In fact, had I not posted here, everything I’ve put into the Olive books would likely have been lost. Since my last post a lot has happened. First, I was contacted by two different authors who were also published by Big Earth Publishing (Olive’s now-defunct publisher). We connected via email with a few other authors who were also caught up in this whole mess, sharing information as it became available. Had I not had the good fortune of connecting with these other authors, critical information would have never found its way to me because the publisher had an outdated address on file. Consequently I had received no direct communication from the US Bankruptcy Court in Colorado (where the publisher used to be). The first thing I did was send an official request for a change of address. I won’t go into great detail, but suffice it to say that at this same time plans were already set in motion to destroy books being held in the publisher’s warehouse if they were not claimed and picked up by a certain date—a date that was fast approaching. The books in question at the warehouse that were those owned by the authors, not the publisher. That is true most of the time. However, in some cases (such as mine), authors pay to have the books printed, while the publisher assumes the role as order fulfillment and shipping clerk. This was the arrangement between the publisher and myself after I approached them in January 2016 with the idea. Prior to that I had a typical contract agreement with the publisher, but when the Olive books sold out of inventory a year ago, I was told there were no immediate plans to reprint. Perhaps this should have been a red flag, but in my assessment it seemed better to have my books in stock than not, and the printing costs were not terribly high, so I invested in the future of my own books. Once they were reprinted in February 2016, the rights to, and physical property of, the books became mine. And now my property was sitting in a warehouse, destined for the pulping facility unless I acted fast. Fortunately I did not have to arm wrestle with the attorney for the Trustee overseeing the bankruptcy case as the documentation in my possession backed up my claim for the books. But the race against the clock was now critical—I had to find a way to pick up the books at the warehouse before they were sent to a pulp mill. Enter a gentleman by the name of Tom Wood, one of the other Big Earth authors. Tom works in Denver, not terribly far from the warehouse, and he generously offered to pick up any books for those of us authors in need. I don’t think Tom imagined the quantity of Olive books at that time, but he made good on his offer. On Friday, October 14, Tom retrieved 27 boxes of Olive books (each weighing approximately 25lbs) and delivered them to his place of business. With the books safe from jaws of the pulp mill, I then reached out to a UPS store in Denver, not far from Tom’s office. Darrell Gobble, the owner of the UPS Store #6326 (located at 757 E 20th Ave, suite 370 in Denver) graciously agreed to personally pick up the books and facilitate shipping them to me. The cost to ship the books was obviously not insignificant, but it would have been a lot more had I been forced to book a round trip flight to Denver, rented a truck or van to pick up the books, ship them, and stay in a hotel for 2 nights. I cannot express enough thanks to Tom and Darrell for helping to get my books to me. By this book while you still can. Do business at this store if you live in Denver. I don’t believe bankruptcy ends well for anyone, and I sympathize with all the other authors caught up in this mess. Most, if not all of them, have nothing to show for their years of hard work and passion that went into creating their books. If they happened to own—but did not pick up—their books at the warehouse on October 14th, their books have been sent to the pulp mill by now. If they did not own their books outright, they will have had the opportunity to purchase remaining inventory at an auction that ends on October 28th (but bidders won’t know if they won until the auction ends that day). And they have to pick up their books on October 31 (that doesn’t leave a lot of time to make arrangements). If this isn’t troubling enough, authors caught up in this debacle have to also worry about reversion of rights over their books. Without a publisher to revert the rights, who knows how that will be handled, and how long it will take? If their rights are not reversed, authors cannot shop around for another publisher to pick up the rights to their books. And what of unpaid royalties? I, for example, am owed more than two years back royalties, plus the share of books sold since they were printed last February under the new agreement. I don’t expect that I’ll see any of that. I also feel badly for all the people who worked for Big Earth Publishing who were suddenly out of a job. My contact there over the years, Mira Perrizo, was always great to work with. I owe her a huge thanks for being instrumental in getting Olive published back in 2009. What will become of the Olive books? Amazon is already out of stock. Olive the Little Woolly Bugger, Olive and The Big Stream and Olive Goes for a Wild Ride. The distributor for the books may have a few copies in stock, but I highly doubt it. A few fly shops scattered here and there may have a copy or two on their shelves but I have no way of knowing that. It won’t be long before the independent retail vultures begin listing ridiculous prices for a scant few remaining copies of the books that they happen to have (this always happens when books go out of print). Just wait and see in a month or two: prices will be laughably astronomical. This is what showed up on my doorstep—each box weighing over 70lbs. I have A LOT of books on hand (1,620 give or take), but I have no intentions of getting into the business of becoming a retail book seller or even a wholesaler. I will give some books to retail shops with whom I’ve had a relationship over the years, and I will donate a lot of books to conservation and fly fishing related organizations to be used as fundraisers. And yes, I will keep stock on hand for personal use, so if you need a set of books, feel free to contact me and we may be able to work something out. Eventually I may seek out a new publisher for the Olive series but I’m not sure about that yet. Thank you to all who have supported Olive over the years. I just learned that the publisher of the Olive series, Big Earth Publishing, has filed for bankruptcy. I only heard about it from my former contact at the publisher—I did not receive official notice from the Dept. of Revenue (or whatever entity sends such notices). As an author who has a financial stake in the publisher’s business, I should have been on the mailing list, but was not. If you have another retailer where you like to buy books, you may find Olive there, for the time being. Thanks for your support over the years, and stay tuned for future news. It’s been many months since I last posted anything on the blog about Olive, and I was just starting to think that I needed to break the silence with some sort of news. Unfortunately, I don’t have anything earth-shattering to share at this juncture. I’m still waiting to see the completed script for Olive’s animated film (speculative, mind you), and there’s no news yet on the Olive branded fly rod that I’ve been hoping would have materialized by now. So things are marinating, but not quite ready to serve up. Then today I got wind of an interview that was just posted by Phil Monahan of the Orvis company. I appreciate the show of support from Orvis, and hope you’ll enjoy the interview. This is also a good reminder for me to get a new “publicity” photo taken. The current one is misleading because it was shot several years ago. I look so relatively young, and fear that I am misrepresenting myself. Every so often I’ll receive an email from a parent whose kids have enjoyed reading Olive, and every bit of feedback is very flattering and much appreciated. Whenever I hear that Olive has brought some joy to a child it’s worth its weight in gold. My husband and I are expecting a baby any day now, and he ordered the first Olive book of the series. (As you can imagine, fly fishing is one of his favorite things to do – and living in Vermont, we’re very fortunate to enjoy all Mother Nature has to offer.) We’ve been reading to the baby and last night we read Olive – it’s fantastic! Not only did I learn more about the fly fishing terms and experiences, but in a more conducive way than my husband could explain! We really enjoy and appreciate the resiliency of Olive and her perseverance. While Randall is not our favorite character we appreciated the fact that everything isn’t a nicety and how Olive still had compassion for him. These are some important lessons we hope to teach our child and are so easily reflected in this book. I don’t mean to describe your book – but I hope I got my point across about how much we enjoyed it, and we’re sure it (as well as the other Olive books) will be a huge hit in our house now and when we can see and read face to face with our newest addition. Thank you for sharing your hard work and passions! Thank you for the kind words, Jessica. Perhaps by now you’ve been gifted with your new baby, and I wish you the very best in the years to come! Many of you may already know about the Olive fly boxes and nippers available through Montana Fly Company. They may be found in any number of fly shops, but that’s hit and miss and I have no idea which all shops carry them. One sure way to get them is in MFC’s Amazon store. I have a link here to a Merchandise Page containing all available Olive-branded merchandise. Stay tuned for future announcements about the rod and reel outfit! I love hearing from fans of Olive. When someone takes the time to send an email or write a letter telling me that they love Olive the Woolly Bugger, it does my heart good and makes it all worthwhile. Recently I received and email from Ashley in Montana who mentioned that her son loves fly fishing and fly tying and the Olive books. He had written me a letter and wanted to mail it to me; Ashley requested my address, which I happily shared with her. A few days later I received a very nice letter from her son, Oliver. I rilly licke the Olive the Wolly bugger Book’s so can you think abbout a copel more Bok’s in the seires. As an author I haven’t received all that many letters, but this is one of my favorites. I wrote Oliver back and sent him a bookmark and sticker, but I forgot to mention to him that years ago when I wrote the story of Olive the Little Woolly Bugger I struggled with the decision to make the main character a boy or girl. Had it been a boy, his name would have been Oliver the Woolly Bugger. Thanks again, Oliver, for taking the time to write. Hopefully there will be at least two more books in the future. Tell all your friends about Olive- that may help ensure that the next books get published. You are a school employee. You would like to bring a particular children’s book author to your school for an author visit but that costs money, and your PTSA doesn’t have the funding available. What to do? There are many sources for grants that are available for just this sort of thing, if you can find them. One such grant that has come to mind is through Target’s Early Childhood Reading Grants that are designed to help kids across America get a head start on reading. 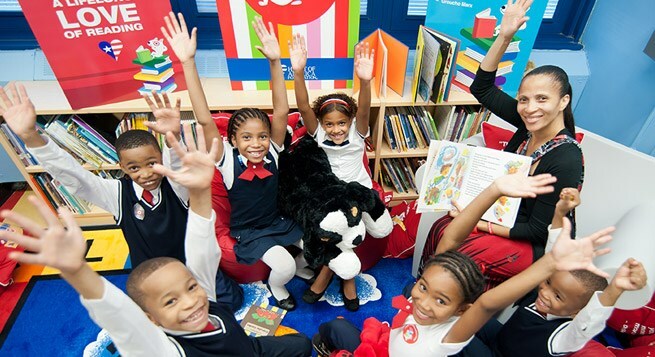 These grants can be used for a variety of reading-related programs, including author visits. Grants must be applied for by April 30 of the current year. This is a wonderful opportunity thanks to Target—apply for your grant now! For information about author visits for this author, please go HERE. I’ve known about The Angling Bookstore for several years. In fact, it was right before the Olive books were first published that I attended the Fly Fishing Show in Bellevue, WA; it was here that I learned about The Angling Bookstore. Since then the folks behind The Angling Bookstore have been very supportive of the Olive books, always including Olive on their roadshow each year as part of the Fly Fishing Show. From an author’s standpoint it’s important to be included in these shows because they target specifically my main audience: anglers, young and old and in between. It’seven better when the author can be on hand to introduce the books to the audience, which I was finally able to do. The Fly Fishing Show has been gone from Bellevue for the past few years, but returned to the Seattle area in 2013. The Lynnwood Convention Center was the host venue, and thanks to The Angling Bookstore I was able to be on hand in the Author’s Booth for two days, signing books, meeting old friends and making new ones. It was a great opportunity for me and I wanted to publicly thank The Angling Bookstore for their support. But after finally getting a chance to meet them, The Angling Bookstore now has a face, or rather two faces: Ben and Brooke Furimsky. If you’re lucky enough to attend one of the last two remaining Fly Fishing Shows this year, stop by Ben and Brooke’s booth. The selection of titles is amazing and they’re great folks. And if you miss the show, visit them online year-round. Tell ’em Olive sent you.